As a busy working mom who runs a business, teaches, and does volunteer work, I just can’t make it to the gym. That being said, I also grew up with exercise equipment in the laundry room and basement – so to me, working out at home most days is normal. Seeing my parents exercise regularly on these machines, shooting hoops, or taking walks made this seem like part of the routine of living a healthy lifestyle. Not only that, being raised this way made me see how easy it is to fit a little fitness fun into my daily schedule, without having to sacrifice too many hours in the day. No need to get fancy schmancy! Our home gym is pretty much filled with someone else’s unwanted, underutilized, or discarded fitness supplies and guess what—it’s FANTASTIC! We bought a factory-refurbished elliptical for 1/3 of the price, a used treadmill on Craigslist for ¼ of the list price, used free weights on Ebay, exercise bands on Amazon, and got a free unused Bosu ball off of a friend. If you’ve exhausted all these options and aren’t sure where to look next, find out if the gym you’re at (and currently paying too much money for) uses a company that refurbishes their equipment. Oftentimes you’ll find that company sells used equipment too, and you can buy it straight from the source! If you’re new to working out, ask your exercise-lovin’ friends what they use the most and why. Research the items and/or machines you want and what you’ll realistically utilize in your home so you don’t get sidetracked feasting your eyes on things you don’t need. Check out the customer reviews on various websites. This will expose pros and cons to certain equipment and may open your eyes to a better product. Reference professional consumer rating websites, like Good Housekeeping and Consumer Reports to compare items side-by-side. Go to the gym and try different equipment to see what would fit best for your home gym space, whether it is the bedroom, laundry room, basement, or garage. Some items can fold-up to fit in small storage spaces if you have limited space. You can wheel out the equipment when it is time to work out and store it out of sight when you are done. If you are buying used equipment from an online source (like Craigslist), make sure you can see and/or use the item before you purchase it. Have a friend go with you to pick up the equipment for extra safety! If you cannot find anyone to go with, request meeting at the parking lot of a police station instead. Bring a (strong) friend to help you move, and who knows, maybe they’ll turn into your home gym buddy and keep you from skipping your workouts! Ask friends or family members if they have or know anyone with equipment or gym gadgets that is doing a better job collecting dust than improving fitness. You can work out a deal with them or perhaps inspire them to get moving again! Think you got a good deal? Be sure to cross reference the cost you are offered from a person, gym, or online source with the manufacturer’s website or a source like Amazon. If you are paying the “new price” or more you better get your negotiating pants on! 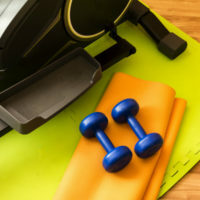 By following these tips, you’ll be able to set up a home gym for a fraction of the cost. Plus, working out at home sets a great example for the kids and the rest of your family. You may even find that your new setup is cheaper than your current gym membership! Next check out new, old and odd fitness fads that may help you get your groove on!